Andy: Based on the smell of Tortuga, it made me want to vomit. And after trying it straight…OMG…I had to fully focus all efforts on not hurling. After mixing, it really tones down the high alcohol flavor. The taste is easily masked by outside flavors so it might be a good way to spike a punch….but use with caution. Adrian: This is pure lighter fluid and I would never drink this straight. It’s good to kick up the alcohol content of a drink, but I would use it sparingly. Like 161 this should be used sparingly and only when guys intend to get a load on. Be wary that this burning, stinging fluid is much harsher coming up, so use your judgement in buying or drinking this. 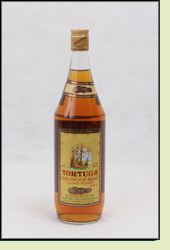 Fortunately means turtle and like the island it has funky taste and smells.